Creative Alliance is proud to support our Muslim neighbors. Did you know we are finishing up a 6-part series bringing in female artists from Muslim backgrounds to Baltimore to share their talents with Baltimore students to increase understanding? 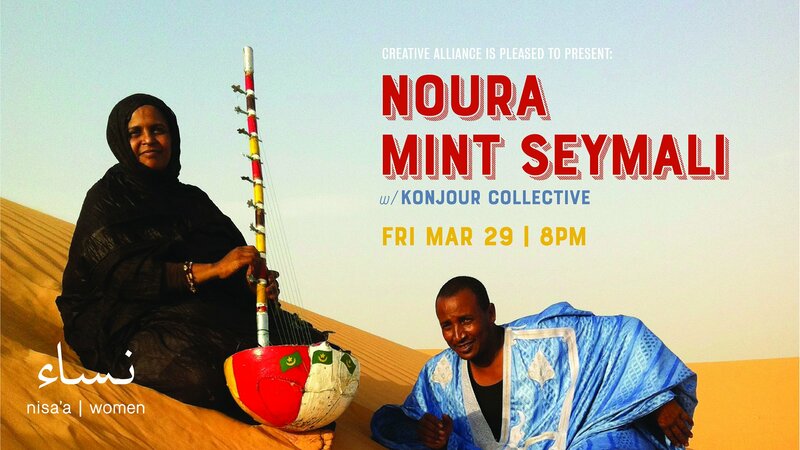 Come celebrate our final part of this series with African Moorish Griot Noura Mint Seymali and her psychedelic band on Friday March 29th. Tickets are just $13 and include a halal dinner. The final performance and school residency activities of the Nisa'a | Women: Muslim Cultural Identity - Six Women on Stage and in Conversation series highlights all the work done over the past two years with incredible women performers. Nisa’a | Women celebrates the powerful artistry of women with roots in Muslim communities in the U.S. and around the world. During extended engagements in the city, these artists have performed and participated in conversations with students at Baltimore City schools and audiences at the Creative Alliance. Each artist has also had the opportunity to collaborate with Baltimore performers to create new work and combine backgrounds. The Creative Alliance is one of 11 non-profit organizations that received a highly competitive grant from the Doris Duke Foundation for Islamic Art's (DFFIA)’S Building Bridges Program, whose mission is to advance relationships, increase understanding and reduce bias between Muslim and non-Muslim communities. The a multi-year NISA'A | WOMEN program that has brought renowned Muslim women performers from around the globe to Baltimore for multiple days of community engagement, conversation, and performance. Each of these performing artists comes with a distinct set of personal experiences from different places, societies, and cultural traditions to celebrate the complexity of Muslim women today. The final week of the program is March 18th to March 22nd. Watch some highlights from NISA'A | WOMEN! NISA'A | WOMEN from Creative Alliance on Vimeo.